The Reformation doctrine least in evidence today is ‘the sufficiency of Scripture.’ An examination of the creeds of the Reformers will show that they all adhered to the authority of Scripture over the authority of ecclesiastical officials and tradition. In the Reformed or Calvinist stream, in contrast to later developments among Lutherans, Scripture was viewed as sufficient for the guidance of the worship, mission, and government of the Christ’s Church. The passage below is an example of this view. 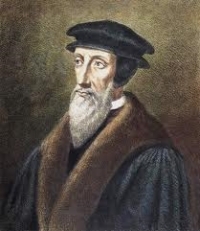 It was excerpted from Calvin’s tract of 1544 titled The Necessity of Reforming the Church. This work should be read or reread by all who claim to be ‘Reformed.’ It has been reprinted in 1995 by the Protestant Heritage Press, and is available over the internet from Still Waters Revival Books. [T]he rule which distinguishes between pure and vitiated worship is of universal application, in order that we may not adopt any device which seems fit to ourselves, but look to the injunction of him who alone is entitled to prescribe. Therefore, if we would have him to approve our worship, this rule, which he everywhere enforces with utmost strictness, must be carefully observed. For there is a twofold reason why the Lord, in condemning and prohibiting all fictitious worship, requires us to give obedience only to his own voice. First, it tends greatly to establish his authority that we do not follow our own pleasure, but depend entirely on his sovereignty; and, secondly, such is our folly, that when we are left at liberty, all we are able to do is to go astray. And then when once we have turned aside from the right path, there is no end to our wanderings, until we get buried under a multitude of superstitions. Justly, therefore, does the Lord, in order to assert his full right of dominion, strictly enjoin what he wishes us to do, and at once reject all human devices which are at variance with his command. Justly, too, does he in express terms, define our limits, that we may not, by fabricating perverse modes of worship, provoke his anger against us. I know how difficult it is to persuade the world that God disapproves of all modes of worship not expressly sanctioned by his word. The opposite persuasion which cleaves to them, being seated, as it were, in their very bones and marrow, is, that whatever they do has in itself sufficient sanction, provided it exhibits some kind of zeal for the honor of God. But since God not only regards as fruitless, but also plainly abominates, whatever we undertake from zeal to his worship, if at variance with his command, what do we gain by a contrary course? The words of God are clear and distinct, ‘Obedience is better than sacrifice.’ ‘In vain do they worship me, teaching for doctrines the commandments of men,’ (1 Sam. 15:22; Matt. 15:9). Every addition to his word, especially in this matter, is a lie.